With her connections and involvement in the Old Pueblo, one would automatically think Deb Salaiz is a native Tucsonan. Nope — she was born and raised in Southern California, but she happily embraced Tucson as her new home after moving here to work for General Dynamics, which later became Hughes Aircraft. Deb — who received her Bachelor’s degree in accounting and economics from the University of La Verne and earned a Master’s degree in business from the University of Phoenix — now works at Raytheon, where she is senior manager of proposals excellence. 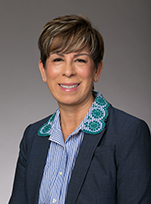 Before joining YOTO, Deb served on the board for the Sunnyside Unified School District Foundation for eight years, where she worked with current YOTO chief executive officer Nicola Hartmann. She saw the success that Nicola brought to the foundation and was eager to join her at YOTO after Hartmann approached her to join the organization last year. Deb enjoys serving on the board because she loves Tucson and wants to give back to the community. She thinks there’s no better way to do that than support YOTO. In addition to serving on the YOTO board, Deb loves spending time with her family and working at Raytheon, a job she wouldn’t have imagined when she was first employed as a receptionist at her grandmother’s hair salon in Los Angeles as a teenager. Deb also enjoys collecting local art and being involved in the art community, which is why she would travel to Italy if she was given the opportunity to travel anywhere in the world. She visited once but is anxious to go back to see more art and appreciate the country’s rich history. If she could only watch one movie for the rest of her life, Deb says the first one that comes to mind is The Family Guy, a holiday movie starring Nicholas Cage, because she likes the story and its moral. Her favorite thing about living in Tucson is the small-town atmosphere that has the culture of a big city, but without the traffic and crowds that were common where she grew up. She loves the nature and the people, and is especially thankful for the opportunity to serve on YOTO’s board of directors and make an impact on the community she calls home.